If you’re inspired by The Masters some new golf kit may be just the motivation you need to get back to the green. While new shoes, clothes and clubs may not make you on par with Dustin Johnson or Rory McIlroy, they could get you in the swing of practising more. We’ve rounded up the best kit to throw in your bag that could get you help you get closer to a hole in one. Nike's Lunar Control Vapor shoes have been put through their paces by Rory McIlroy and have a quirky Articulates Integrated Traction outsole for a stable base. Inspired by the tread on snowmobiles, the new traction system decouples the medial heel and lateral forefoot area to help propel the athlete through the swing. The articulated channels also allow for better balance while keeping the golfer lower to the ground and the tread allows for maximum traction to stop slipping. The shoes have a microfibre fabric that comes with a two year waterproof guarantee to keep you dry on the course. A smartwatch could help you up your game. Garmin’s Approach X40 combines daily activity tracking and heart rate data with golf data for more than 40,000 courses. The screen on the slim band shows distances for each green as well as hazards and also shows a digital scorecard. AutoShot tracking measures and records shot distances for post-round analysis. The unobtrusive device also works with Garmin’s TruSwing club sensor for yet more metrics. 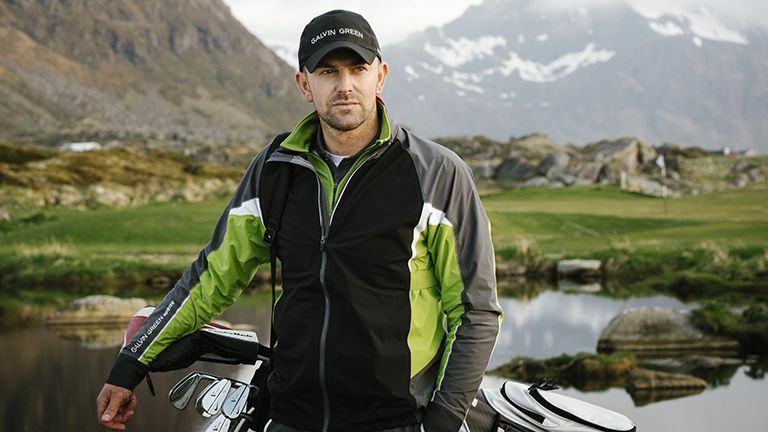 If a little shower (or torrential downpour) doesn't put you off a round of golf, you'll need a reliable jacket and that's where the Galvin Green Argon C-KNIT GORE-TEX Jacket comes in. The waterproof, full zip jacket is made from C-KNIT GORE-TEX STRETCH three-layer fabric for comfort and freedom of movement throughout the swing. The fabric also contains a backer for a softer, quieter garment. As well as being lightweight and breathable, the jacket comes with a lifetime waterproof warranty and can be cleaned in the washing machine. Golfing pros love Spider putters and if you want to be more like Jason Day than Happy Gilmour (tap, tap tap) the TaylorMade Spider Tour putter could be worth investing in. The unusual club has perimeter weighting for stability and a remove sightline to help players focus. It comes in red, black or grey. The putter’s Pure Roll insert combines 45° grooves with a softer polymer to increase topspin and improve forward roll across varying surfaces, helping the ball start and stay on its intended line (depending on your skill level, obviously). You may not have a personal caddy like the pros but you could have a cart that follows you across the fairway. The Stewart Gold X9 Follow has a ‘follow’ mode as well as full remote control functionality to save you lugging your clubs behind you. A Bluetooth electronics system and two antennas power the cart, which folds up neatly. Users need only press the green 'follow' button and walk in front of the cart for it to follow at walking pace. If a player stops for any reason the cart will too but those who are trying to find a ball in the rough, for example, may want to switch to remote mode. Irons come in an infinite array of shapes and finishes and PING’s new i200 clubs promise precision distance with horizontal and vertical trajectory control for a wide range of abilities. The 431 stainless steel are slim in shape and compact to give players full command of their shot and ‘unprecedented feel and forgiveness’. High-launching and distance-generating, they come in a choice of steel or graphite. If you've invested in some new irons and putters, you'll want some hi-tech balls to match. TaylorMade's TP5 balls have five layers to increase driver distance, control and spin. They have a Tri-Fast Core for increased velocity and a Dual-Spin cover that's claimed to create a condition that is ideal for greenside control as the rigid inner cover forces the soft urethane cover into wedge grooves for maximum spin generation. Even if your swing is a bit sloppy, you’ll want to look sharp on the golf course. Ping’s Brett polo shirt features Coolmax All Season fabric that transports moisture away from the body to keep the wearer cool and dry on hot days – handy if it’s a summer day and you’re an hour away from the 19th hole for a cold pint. The clever fabric also provides insulation on colder days thanks to its moisture management performance and is also crease resistant, because who wants a hobby where extra ironing is involved. If you want to improve your swing, a smart glove could help. The Zepp Golf 2 kit comprises a glove, app and a clip-on sensor, which means that unlike a club-based sensor, it doesn't have to be swapped over depending on the shot chosen. The sensor collects swing data automatically and transfers it via Bluetooth to the app. Ingeniously practice shots aren't recorded as impact is assessed and users can carry their smartphone in their pocket to measure hip turn too. For each swing they can see their hand, club and swing plane movements in the app and review stats at a later date to (hopefully) improve their handicap. Critics say golf is a good walk spoiled and even keen players may be forced to reluctantly agree if they have to traipse around a course in uncomfortable shoes. In a bid to allay this problem, the Ecco Cool shoe features Gore-Tex Surround technology. An advanced air channelling system within the grid-shaped sole structure provides 360° breathability while remaining waterproof, in order to keep feet dry in all conditions. Excess moisture and heat is able to escape through the Gore-Tex fabric as well as through the highly breathable midsole, ensuring feet stay dry and comfortable, even in warmer conditions. For days when the weather is too bad for even the sturdiest of golf umbrellas, there are golfing simulators you can use at home. The Golf Club video game was originally available for the PlayStation but has just launched as VR game. Players can drive golf carts as well as play on 130,000 courses by wearing an HTC Vive or Oculus Rift headset, for example. There’s also a 3D swing analyser, range finder, different levels, multiplayer mode and ghost play for golf addicts who like to get a little more competitive. Nike sponsors the likes of Rory McIlroy and while you might not have his skill or bank balance, you can get the shirt of his back (kind of). Nike makes shirts featuring tech used by the pros including Nike UV Reveal, which provides protection from the sun and heat. It also reveals underlying colour cross the shoulder when the fabric is stretched, highlighting the flexibility of the polo throughout the swing. For those wanting to emulate Mr McIlroy, he favours the Nike MM Fly Blade and the Nike MM Fly Blade Block polo with blade collars. A great golfing gift for cheats. The Longridge Golf Ball Monogrammer lets you print your initials on your golf balls to avoid them getting muddled up with other players’ (or dare we say it, deliberately swapped or lost). The pleasingly basic tool uses a uses a mess-free ink transfer tape and comes supplied with a lacquer that provides a protective coat that will last as long as the ball does. It lets users place up to three letter blocks into the device then all they have to do is close the clamp to print the letters on the ball.